Every image of a project has qualities all unto itself. Sometimes it tells a story. Other times it’s the lighting or the focus on a single element of the design. These twelve images are powerful enough to stand alone in a potpourri that gives us pleasure just for the joy of a well-done image that captures one essential part of a design. Take a moment and ponder over each one. It will make you happy. 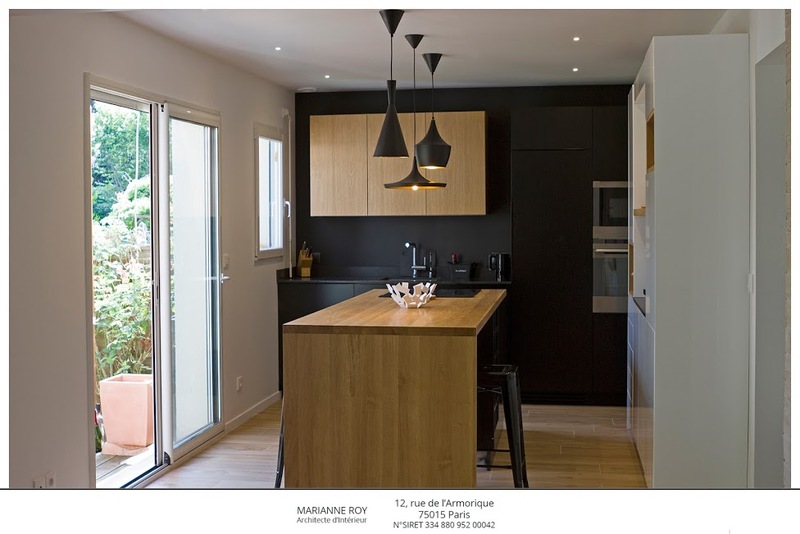 Discover the Before & After of Philippe’s kitchen ! 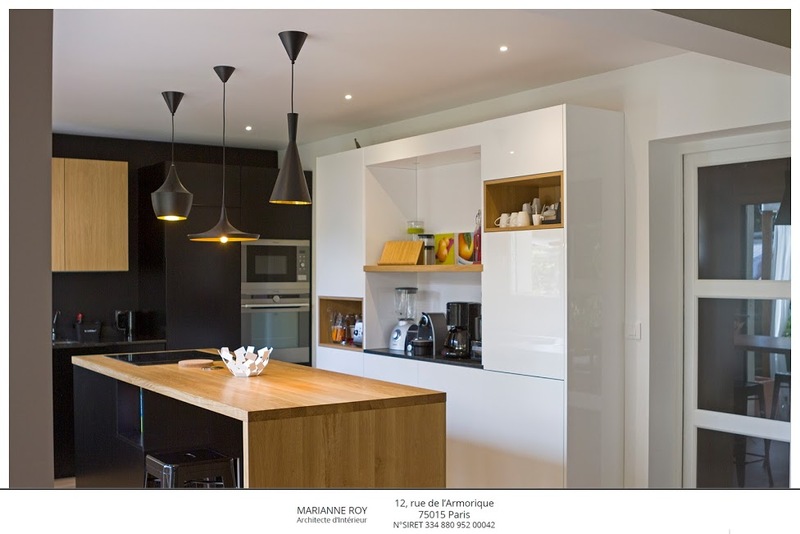 The nature of this project was a complete redesign of our kitchen through a uniformity with the current living room (realized by our architect Marianne, a few years ago). This project was first conceived to improve the continuity of the space entrance-stay-kitchen in a more contemporary spirit. 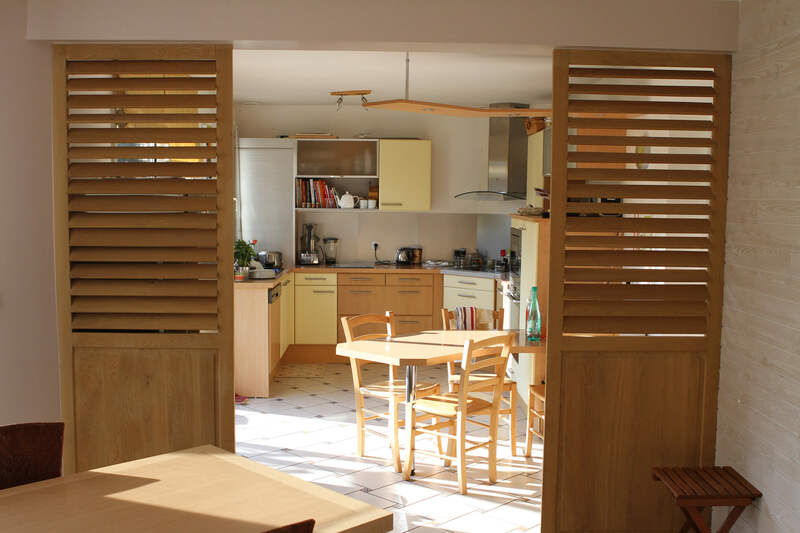 This project began with the idea of replacing a rather old-fashioned white tile (with a low-temperature heating requirement by the floor) with a tile that would take on the attributes of an oak type parquet floor (light) and offer the new kitchen a more pleasant living space. You will find attached some pictures of the old kitchen, installed about fifteen years ago when the house was built. 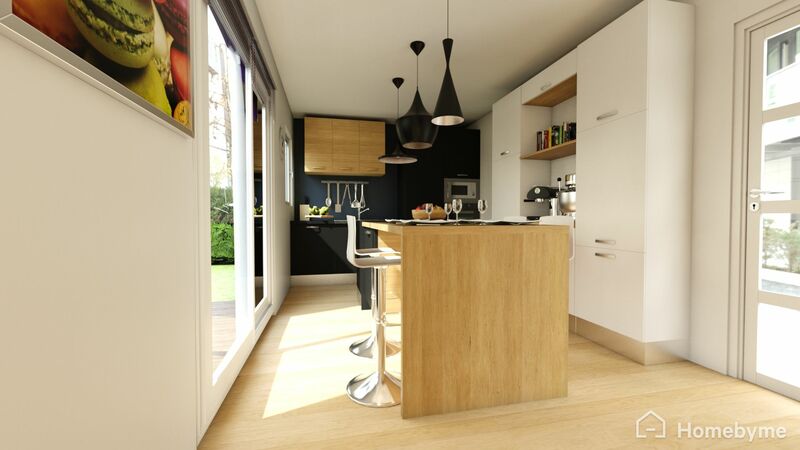 Most of the work consisted of a complete refurbishment of the kitchen area on the basis of parquet floor tiles. The whole kitchen has been redesigned “from scratch”: layout, fittings, electricity, plumbing and paintings on the basis of several scenarios based on a very collective cooperation between Marianne and my wife (I was only an admiring observer 😉 – the choice of paintings and colours of the kitchen have been very worked to explore different alternatives in the proportions of white, black and oak. 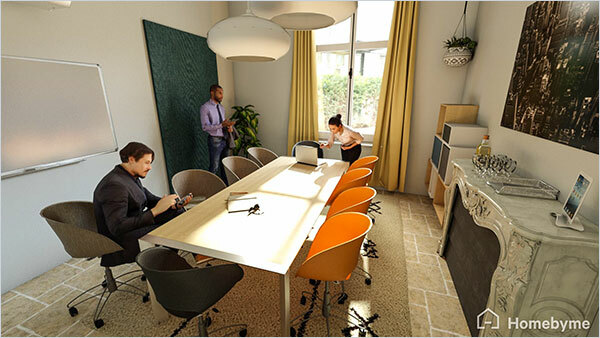 The choice of materials was also crucial to homogenize the heat of the space. 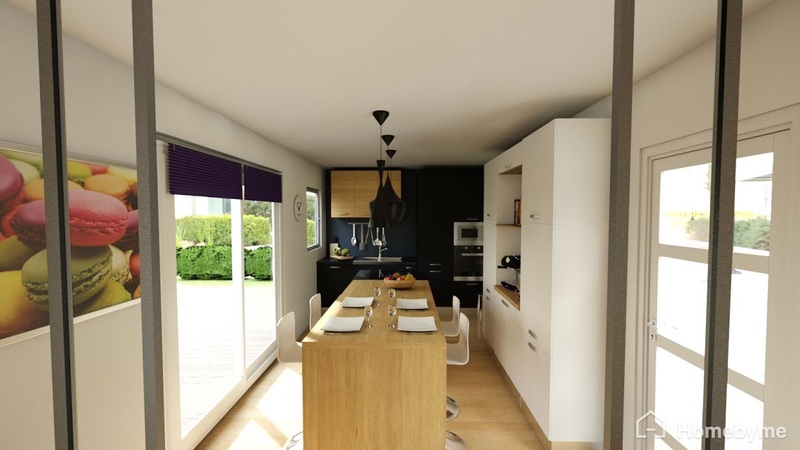 The use of HomeByMe has been crucial in the choice of layouts and colours. 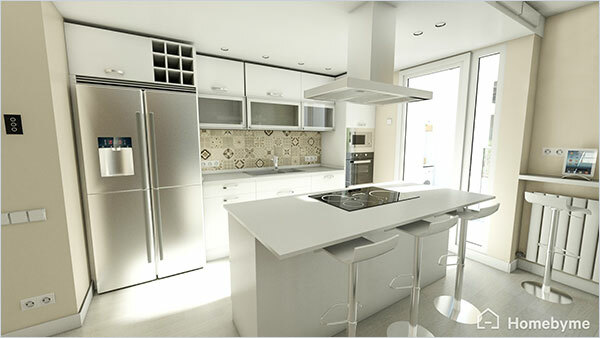 The rendering of the realistic images really allowed to put in situation the communication of the living room and the kitchen space, even if it is always difficult to realize that the realistic images would be as much 😉 – It was only after the realisation of this project that we realised the emotional impact that the synthetic images of HomeByMe could have. However, if we had to make a comment on the use of HomeByMe, we find that it applies more to creation from a blank sheet of paper, favouring inspiration from a very large library of objects; than in a more constrained space where customization becomes an unavoidable and necessary variable. As soon as made-to-measure becomes dominant, it is more difficult to conform more finely to the constraints of manufacture and practicality of the kitchen space: I would say here that it is from this moment that the work of the architecture becomes priceless! The work of the craftsmen supervised by Marianne is also remarkable. It’s time to show off some of your best projects! These five examples are just a few of the dozens of great projects that you create every day. To be amazed by even more fantastic homes, check out the HomeByMe Gallery. You can reach the Gallery anytime from your projects page. Just click Top projects to the left of My projects or farther down in the Featured projects section click on Our best user projects. No matter how you get there you’ll find a feast of projects to bring new inspiration to your own projects!